Hotel Rantasipi, 76 € / double room / night. Email sveitsi.rantasipi [at] restel.fi for bookings. 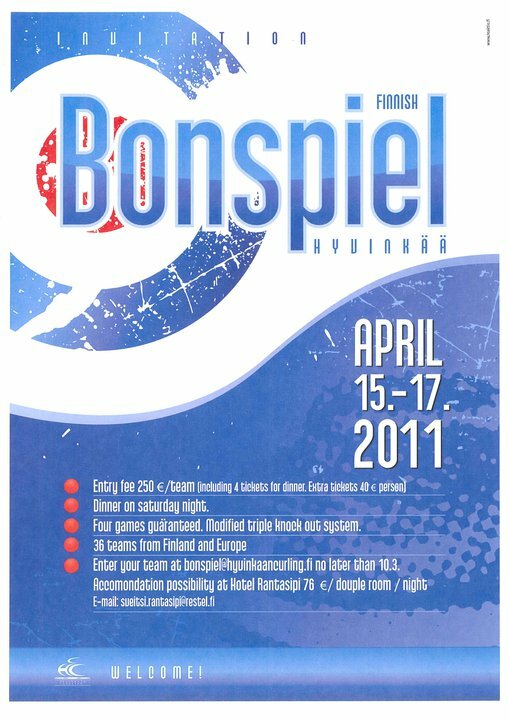 Finnish Bonspiel is the most traditional bonspiel in Finland with a history of more than 30 years. Finnish Bonspiel is the last tournament of Finnish curling season and the atmosphere is very relaxed and social. The tournament is normally full-booked very early so don't delay with your registration! Entry fee includes 4 tickets for Saturday night dinner. Extra tickets 40 €. Four games guaranteed, modified triple knockout system.